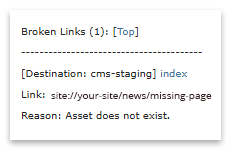 The CMS has limited ability to check for broken links, however a combination of the link checking methods below will help ensure your links are fully functional. Internal links are links contained within your site, such as one page linking to another. An internal link check is automatically performed during publish. External links are links that take website visitors to another site. The CMS does not have the ability to check external links, however third-party tools are available for checking all links on your live site.